Anhinga, originally uploaded by Elizabeth Smith. A lot of viewers may not be familiar with the Anhinga, but it’s a common bird along the waterways of Florida. Sometimes called the Snake Bird or Water Turkey, it can be seen diving, swimming or drying its feathers along our canals, bays, and lakes. Anhingas are called the Snake Bird because when they emerge from underwater and swim for shore, their long sinuous neck resembles a snake. They’re very distinctive in appearance; the males are black and white, while the females and juveniles are deep brown with a buff or light brown neck. Often striking a pose on a perch near the water, they spread their wings wide to dry in the sun. Their wings in this position remind me of a black cape with epaulets and silvery white ribbons. Anhingas pose like this because they don’t secrete oil to waterproof their feathers (like ducks or geese do), and rely on air drying in order to fly. This lack of oil helps make them less buoyant, allowing them to dive more efficiently and stay underwater longer. A member of the Darter family, you may have guessed that these birds are piscivores, or fish-eaters. For a quick overview of the Anhinga, visit The Cornell Lab of Ornithology ; included are some short facts, a distribution map, and an audio record of their call. For a more in-depth read, visit the Wikipedia entry. I found this Anhinga sitting on the bridge walkway over one of the lakes at Freedom Park, and took several reference photos for drawing later. I've never had a chance to get this close to one of these beautiful birds before creating a flustered takeoff, and I'm happy I didn't cause this bird any apparent stress! Clicking on the topmost image will take you to my Flickr photostream. Parents and teachers, you can click HERE to download a free PDF coloring page of an Anhinga. For whatever reason (to remain unknown) my uncle always called these birds "pondswoggles." 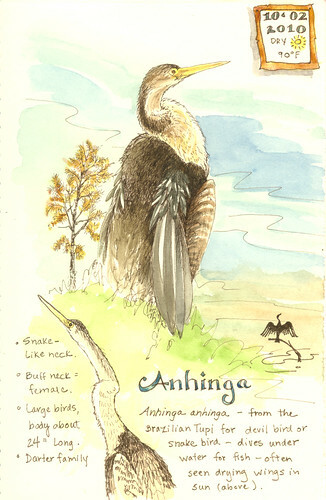 I was well into my adult years before I learned they were anhingas! Beautiful page, Elizabeth! Anhingas are a favorite of mine. They have a very calligraphic neck. Love the detail you've achieved. I think of anhingas when I see turkey vultures or cormorants spreading their wings to dry. I always hope to find an anhinga in INdiana some day. That would be quite the birding coup. 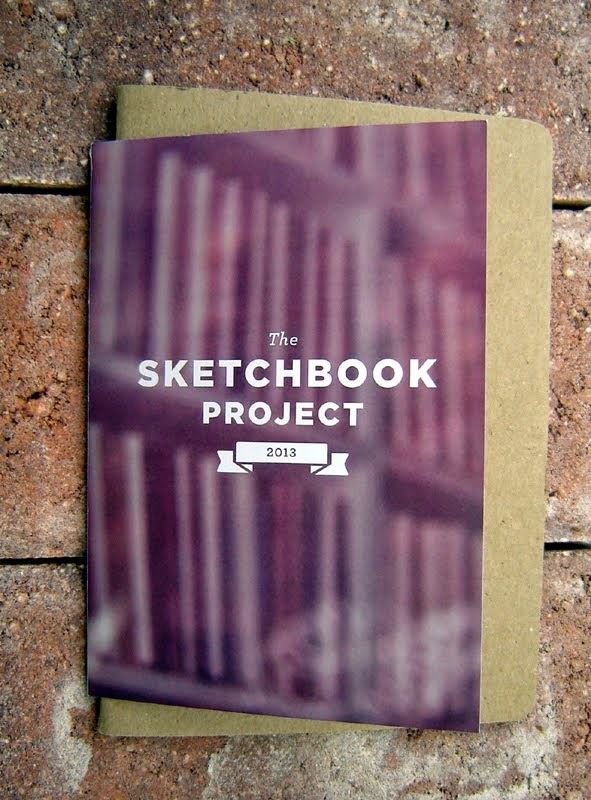 This is a marvelous page in your journal. 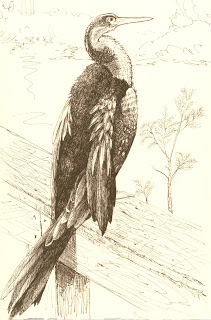 Your sketches are both beautifully done, Elizabeth, and I loved reading about this bird that I've never seen. Thank you! Hi Laure! I love that word: pondswoggles! Maybe it refers to their ungainly flight when their feathers are waterlogged. And thank you! Ha, Jeanette – you’re probably right about that. I didn’t think of wet feathers. She (or a young “he”), wasn’t doing the normal wing spread for feather drying and I didn’t even consider that. Yes…the detail. I meant to do something simple, and got caught up in the intricacies of textures. Sometimes continuing to see where the drawing takes you is good therapy! Thanks, Pam! They are a favorite of mine, too. Usually I find myself drawing the distinctive black and white male with wings spread, but this is a deeper connection to the species. I was so glad to have this experience. Hello Lisa, and thank you! In my research I learned that Anhingas will wander northward, they have been spotted as far north as Wisconsin, so you never know! 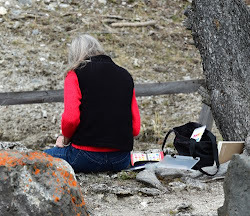 Thank YOU Debbie – I love reading about birds and mammals from your side of the country too! I followed your example and just started sketching with my pen (no pencil). Proportions are not perfect, but I realized that my tentative first lines are quickly hidden by subsequent marks. Saves time and there is less worrying about things – I felt like I connected more, even though I was referring to a photo. Wonderful drawings of a wonderful bird. How fortunate you are to get close to one. You did a beautiful job of capturing it on paper. Elva - thank you for your kind words. I enjoyed sketching it so much! Beautiful sketch--I've seen these birds many times, but didn't know what they were called. Thanks for the info. Glad I could oblige, and thank you! ...I love Anhingas, but I only get to see them when I visit Florida or South Carolina (which is not enough!). I love how you created a coloring page for kids and teachers from your drawing. Very cool. My friend teaches 3rd grade, and she's always looking for cool projects (and since she's my friend, birds have suspiciously become a big thing for her!). I downloaded a copy for her and am sending her to your blog. Hi Kelly, and thank you for your kind words! I loved to color as a kid (ha, I guess I still do! ), and especially loved nature coloring books, but there were never enough realistic drawings out there to suit me. Thanks for directing your teacher friend to my blog; I hope it's helpful and a good resource. I'd say that your bird influence is a good one!